You should now have a skeleton table of series, ready to be filled in with data. The first task should execute the SQL statement TRUNCATE TABLE tblSeries for the X Factor OLEDB connection, while the second one should be a data flow task which we'll configure in a moment. Ignore the yellow triangle! 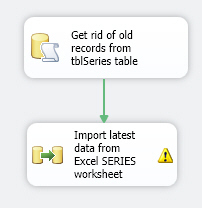 Exports it to the tblSeries table in the X_Factor database (using the existing OLEDB connection). Each time you run the package you get rid of old data in the table before adding new rows.